I'm actually not sure I have the words to justify just how good yesterday went. We went to the pantomime in New Theatre, Cardiff. 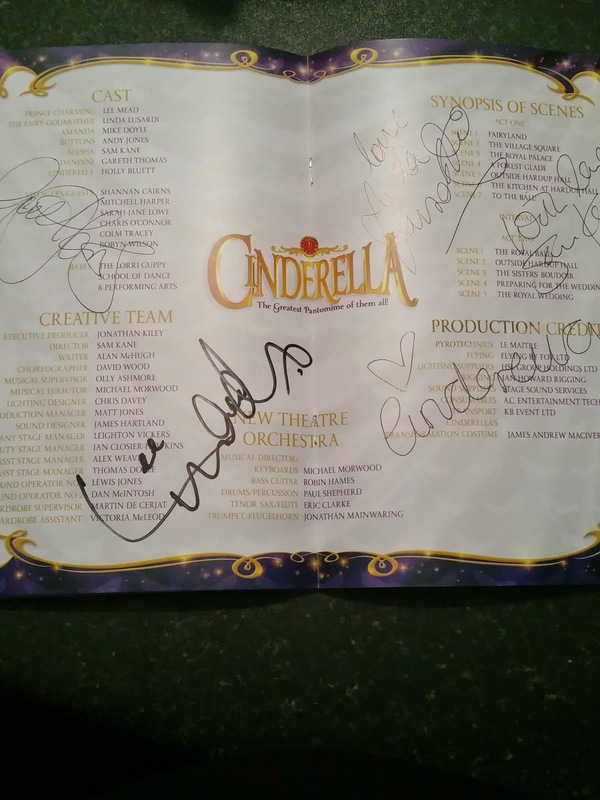 It was filled with some great stars: Lee Meade, Linda Lusardi, Sam Kane, Gareth Thomas, Andy Jones, Mike Doyle and Holly Bluett as Cinderella. My husband bought the tickets some time ago, as a surprise for us all. 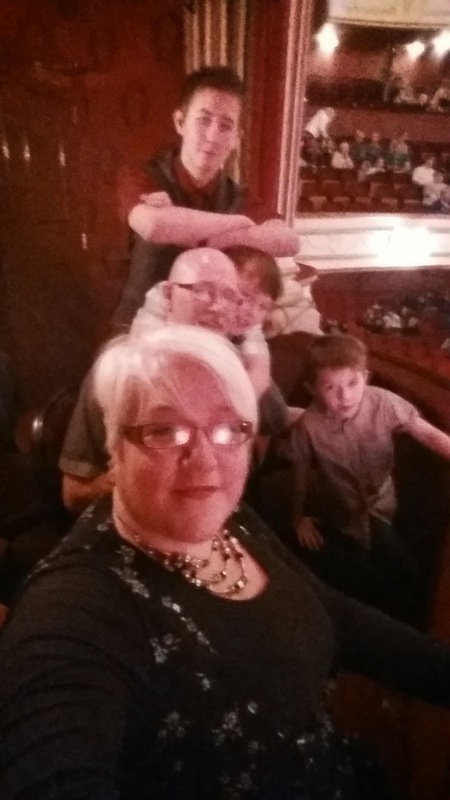 We haven't been to a pantomime, as a family in years, my eldest 2 used to go with my mum, but I haven't been in 22yrs!? It's just too hard, little A needs to stim, and R tends to get really hyper and loud. I know I shouldn't be, but I'm really self conscious of others in this situation, not so much that they would be annoyed, more that they have paid good money to see a show and my children might make it hard. So the big surprise was.........we had a box!!! A little room, off to the side of the stage, right at the front! This was our view of the stage!! It went so well. Little A stood and bounced all the way through the show, he fell in love with Cinderella, felt sorry for buttons, and laughed very loudly at the ugly sisters! R laughed too loud, joined in with the shouting, and stood all the way through. We got to thoroughly enjoy this wonderful show. It was laugh out loud funny, all the way through. Linda Lusardi has an amazing singing voice, her duet with Holly (Cinders) blew my socks off. I'm not going to spoil the show for anyone. 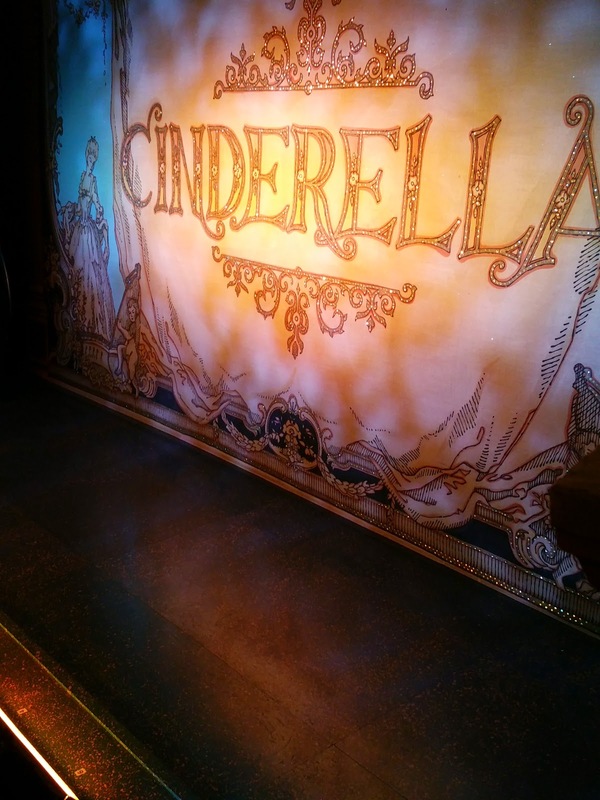 We all know the story of Cinderella, and obviously there are extras to giggle at. I always love the ugly sisters, they get the best, and funniest, lines. Sam Kane and Mike Doyle played their parts brilliantly. With funny voices and crazy costumes, little A picked Sam as his favourite very early on! It was difficult to believe it was only the second day, it was already very professional and slick, probably down to the quality of cast. There was, obviously, the odd mess up, isn't that part of the magic?? It went so well, we've actually booked for Alladin, next year, already! The box was just the perfect surprise, it meant I could totally relax and enjoy the show. One of the highlights of the show was my hubby and the ugly sisters flirting...........Yes, really! We even hung around outside, and waited for some of the stars to come out. It gave the boys a chance to let off some steam. The stars we met were so approachable. Cinderella gave little A a hug, making his night. Gareth Thomas shook R's hand, being a budding rugby player, this was glorious for him, he couldn't stop smiling! Linda and Sam came out and were lovely. They took time to talk as well as signing our programme. Considering how exhausted they must have been, after a long show, this was very much appreciated. If you get a chance to go, then take it! It was a fantastic show, with a great cast. If you can't go to Cardiff, then find one near you, honestly it's great family entertainment. As far as children with Autism, they are doing a special show, with that in mind. Although, I would highly recommend a box as an alternative. With us being a family 5 it didn't work our much more expensive. Are you going to panto this year? Have you been in the past? Do you think it's a Christmas tradition? Speak to me, lovelies. I love your opinions. i've not been to a panto since i was about 10! My 3 have always gone each year with school. We've been to a couple of small panto productions this year, one at Centreparcs and one in the summer, but we've got tickets to the Bristol panto for just after Christmas. I'll be interested to see how Rachel copes with it. Sounds like you have a great time.